Kellogg Community College is offering eight classes and multiple sessions of Nursing Assistant (CNA) Training at the College’s Eastern Academic Center campus in Albion this summer. For a complete list of Summer 2017 semester classes offered at KCC’s Eastern Academic Center, visit www.kellogg.edu and click on “Class Schedules” in the top menu to search for sections. Summer 2017 classes begin May 15 and the semester ends Aug. 7. For information about signing up for summer classes, visit www.kellogg.edu/registration. For more information about KCC’s Eastern Academic Center campus in Albion, visit www.kellogg.edu/eastern. 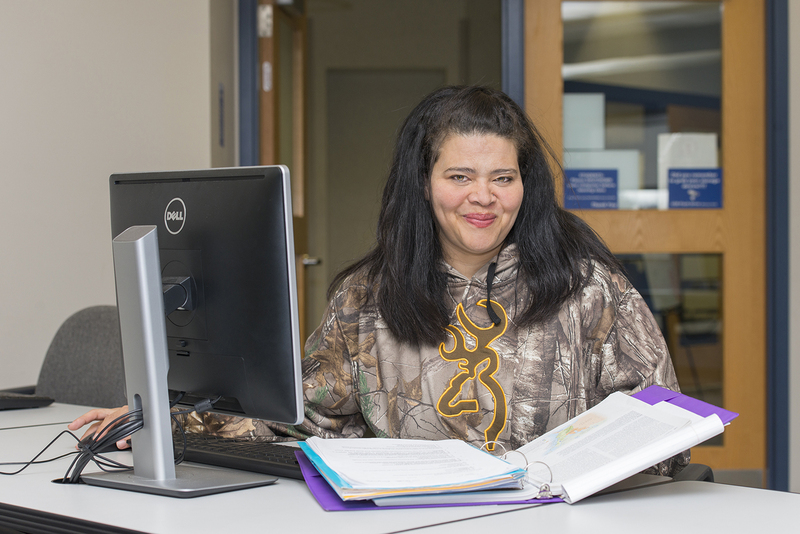 Pictured above, KCC student Coretta Margraves sits in the computer lab at the EAC. Margraves is studying art at KCC with the goal of starting her own photography business. Click here to read more of Margraves’ KCC story.